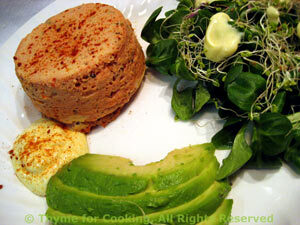 Tomato Flan with Avocado, Thyme for Cooking easy first course. These simple flans have the look and consistency of a soufflé without the work. Combine them with a sliced avocado and a bit of creamy dressing for a colorful first course. Butter and line the bottom with buttered wax or parchment paper (techniques). Make and butter a circle of paper for the top as well. Whisk eggs, tomato sauce, herbs and yogurt together and spoon into ramekins. Put paper circle on top - it doesn't need to touch. Put into a roasting pan with deep sides ( I use a metal bread pan) and add hot water (hot tap water is fine) so that it comes half way up the sides of the ramekins. Bake for 30 minutes at 450F (220C) - they should be set - firm on top. Run a table knife around the sides to loosen (if necessary). Put a small plate over top of ramekin and flip over. Remove ramekin, and paper from top (formerly bottom) of timbale. Carefully turn back so top is up. Remove paper. Cut avocado and remove pit. (techniques). Slice thinly and fan slices around flan. Mix mayonnaise, yogurt and mustard. Add half to each plate, along with a bit of spinach and serve.